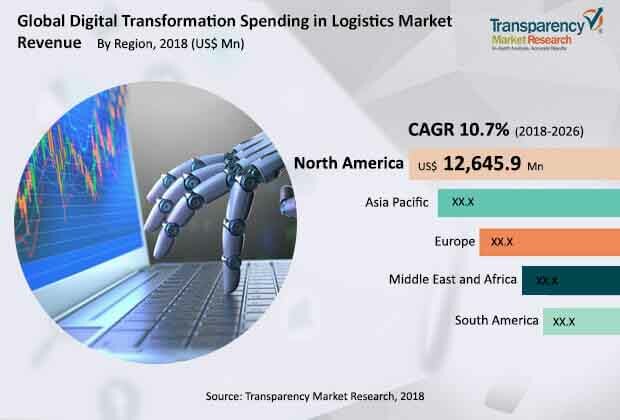 According to a new market report published by Transparency Market Research, the global digital transformation spending in logistics market is projected to reach US$ 94,972.3 Mn by 2026 driven by exponential rise in digital transformation spending in logistics modules. The market is projected to expand at a CAGR of 10.7% during the forecast period from 2018 to 2026. Growth of the market is attributed to rise in demand for digital transformation in logistics and increase in adoption of cloud-based deployment models to offer quality services to clients. North America is anticipated to lead the global digital transformation spending in logistics market, followed by Asia Pacific, Europe, Middle East & Africa, and South America, during the forecast period. The digital transformation spending in logistics market is in a nascent stage and is anticipated to expand rapidly in the next few years. Digitalization is happening across industries, and the benefits are revolutionary for companies with greater consumer awareness and reach, higher productivity, and innovative business models. It offers the potential for old-economy sectors to take steps in pushing efficiency and customer ease. Industries are investing in digital solutions for input, processing, and output competences throughout the business ecosystems. Above and beyond the benefits, several industries are pushed toward the adoption of new technologies due to new regulatory regimes. The utilities sector, for instance, has been induced toward adopting smart meters and liberalization of the energy markets. The transportation and logistics sector continues to make investments in digitally enabled infrastructure and has achieved efficiency improvements as a result of open-skies agreements and other regulations. This also leads to various kinds of integration. For instance, XPO Logistics, with a futuristic vision, started developing in-house digital solutions (backward integration) pertaining to logistics & supply chain solutions and warehouse management systems. This provides the company an upper hand in terms of overall spend on digital solutions. XPO invests around US$ 450 Mn into technology each year. Based on solutions, the global digital transformation spending in logistics market has been segmented into hardware solutions, software solutions, services, deployment, and industry. The hardware solutions segment dominated the global market in 2017. Hardware solutions enable users to optimize their applications on reliable, branded, and customized hardware platforms. In terms of deployment, the cloud-based segment held a prominent market share in 2017 and is expected to continue to dominate the market during the forecast period. North America led the global digital transformation spending in logistics market, accounting for substantial share in 2017. The U.S. is the major market for logistics solutions in the region. Digital logistics solutions are also gaining popularity in Canada and Rest of North America. The digital transformation spending in logistics market in Europe, Asia Pacific, Middle East & Africa, and South America is expected to expand at a rapid pace during the forecast period.